I credit my good friend John Adams with coining the hashtag #roadwarriorprobs. He uses it frequently, and I’ve adopted it as one of my favorites. We use it to describe the good, the bad, and even the ugly that we who travel frequently face from time to time. I like it so much, that I’m bound and determined to grow its use in the vast, wonderful realm of social media. #roadwarriorprobs – the business trip that takes an unexpected turn as the flight home on Thursday is replaced at the last minute by a drive to the next destination to address an urgent situation that has just come up. When this happens, is your glass half full or is it half empty? #roadwarriorprobs – that moment when you’re sitting up in bed at the local Hampton Inn watching the Duck Dynasty clan, knowing that many of your friends and family envision you enjoying a lavish dinner or a night out on the town. 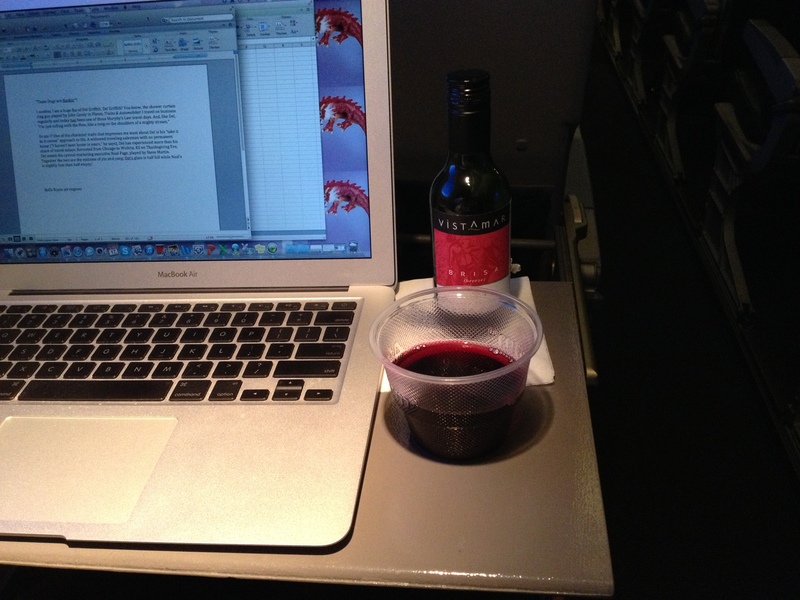 #roadwarriorprobs – speaking of that lavish dinner, there are perks to business travel. One of my favorites comes in the form of relationships, and enjoying a fine meal in the company of people who I’ve come to genuinely like over the years to the point of considering them true friends. #roadwarriorprobs – the snowstorm that wreaks havoc on your travel schedule as it transforms a major US city into a beautiful winter wonderland. Do you stay inside and fret or do you get out and enjoy the beauty? #roadwarriorprobs – that sigh of relief that comes when the wheels go up, you’re in the air, and you are finally able to unwind as you look forward to seeing your family upon arriving home. #roadwarriorprobs – sharing the fun with the one you love. None of these are problems per se. They are the little curve balls life throws us, sometimes when we are least expecting it. Life is what you make it, and I’ve learned over the years to appreciate these times. And when God blesses me with an unexpected moment while I’m away from home you’re likely to see me share it on social media with my favorite hashtag. Fellow road warriors, feel free to join me! Yesterday I set out to journal the amazing day of rest my wife and I enjoyed on Saturday, and instead the words flowed concerning the acquisition of my employer and the new “normal” my coworkers and I face. Well, given the turmoil the transition period put on my work plans, I was so looking forward to resting for a day, and finally got what I wanted last Saturday at the Ritz Carleton Beach Resort in Naples, Florida. As for our day of rest, I’ll allow a few photos to speak for me. What does this have to do with patience? Sit, sometime, and watch a sunset. You’ll understand. So how’s the weather? Depends on who you ask! The Ritz offers an adult pool and a family pool. The adult pool was quiet, serene, and shaded. The family pool was abound with the laughter of children, playful, and sun-drenched. We chose the family pool. 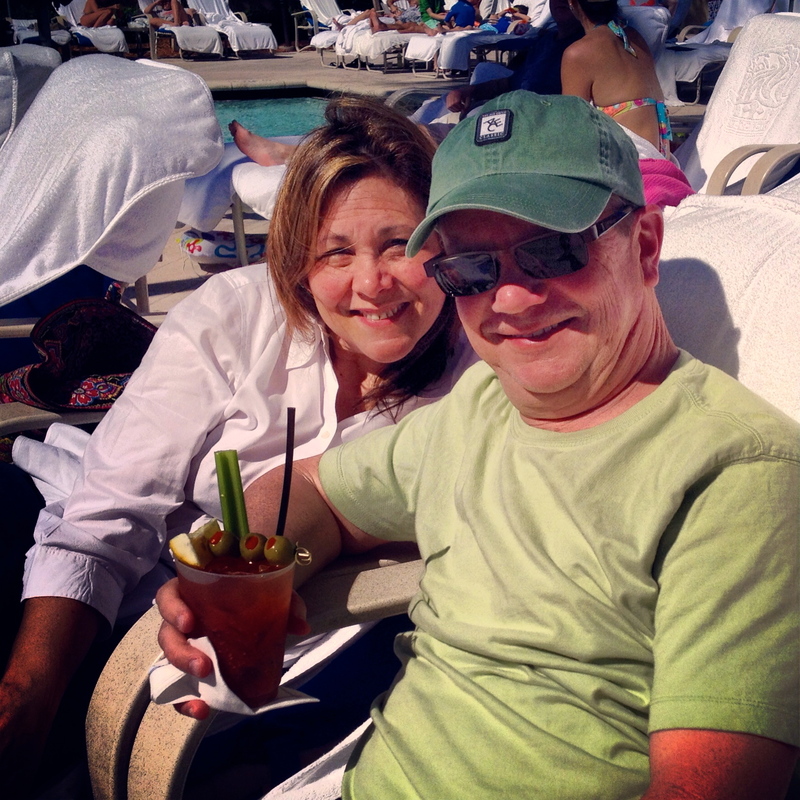 Pool waitress says, “The Bloody Mary is calling!” She was right. Ritz Carlton, Naples, FL. February 2014. The beauty of a palm against a deep blue sky has always made me smile. The Ritz does a lot for children, including introducing new friends. Here, DeLisa gets to know their Bearded Dragon. Enjoyed a cold Yuengling. One, because I like it and, two, because I enjoy saying “Yuengling”! The phenomenon of the “relaxing feet” shot on social media seems a bit strange, but who am I to buck current trends? 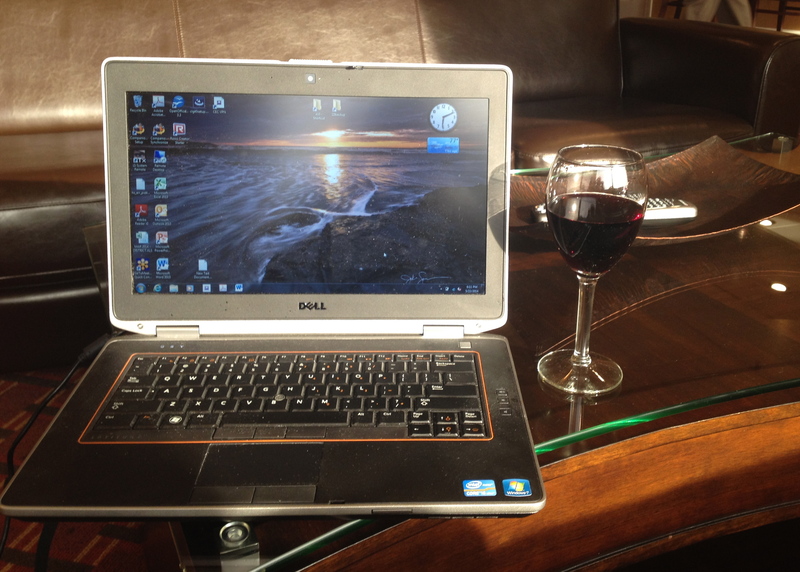 Business travel sometimes throws a curve ball, resulting in changed plans and some degree of inconvenience. In my current situation, I find myself spending my Saturday looking out my window at the Philadelphia Airport Hilton as I await my delayed departure later this afternoon. But, hey, life is what you make it. Not only did I have a successful business trip, but I got to experience this beautiful city in the tranquility of a winter wonderland. 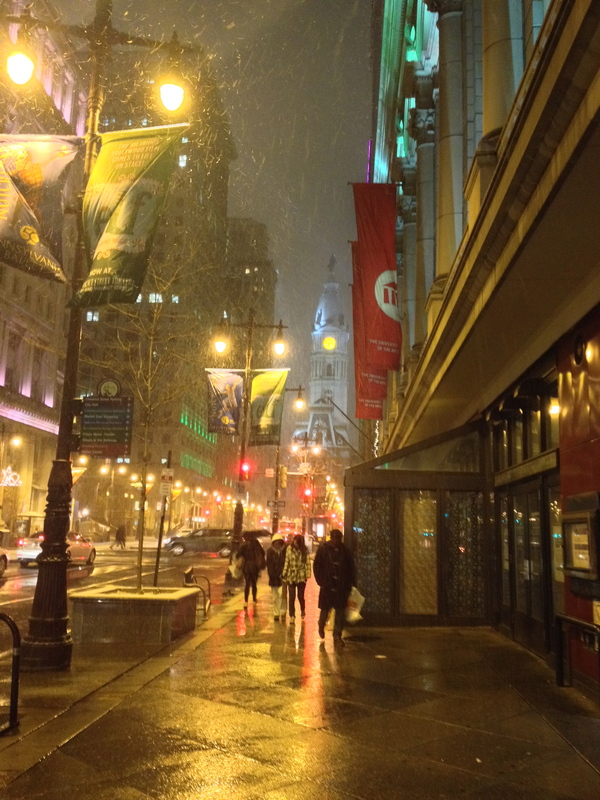 Here are a few of the images I captured as I walked downtown Philadelphia in Thursday evening’s snowstorm. My evening began with a delicious dinner at Sbraga. 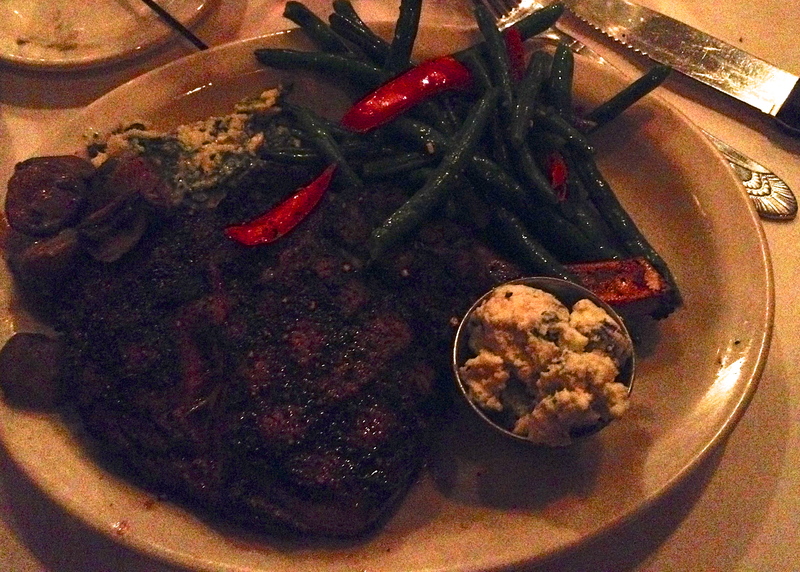 The overall experience of Sbraga was outstanding; my full review will soon be posted on Yelp. Sitting at the bar as the snow began to fall was quite surreal. After my wonderful dinner, I checked into my home for the evening, the Doubletree Philadelphia Center City. The night was still young, however, and a visit for Philadelphia for me is not complete without ducking into Moriarty’s Pub. I took the photo below during my walk from the Doubletree to Moriarty’s. I’m always amazed at how a beautiful snowfall can quiet the big city. People passing by on the sidewalk exchanged smiles. There was an air of peace and tranquility as the snow transformed this bustling downtown into a winter wonderland. Later, I enhanced the photo and posted it on Instagram. Moriarty’s is always a warm and friendly place. Tonight was no different, although many patrons apparently chose to keep warm at home rather than venture out to the pub. Since I had already enjoyed a fabulous dinner, I skipped their wings this evening – but for the record, Moriarity’s wings are my favorites. Anywhere. Nonetheless, my pint of Guinness hit the spot as I watched the snow fly outside from my warm perch at the bar. Venturing out of Moriarty’s to head back to the Doubletree, the snow was really coming down. Few people were on the streets, although it was still quite early. I decided to catch the first half of the Sugar Bowl in the lobby bar at the Doubletree. I snapped this photo on my iPhone as I sat at the bar. Later, I enhanced it with a B&W filter and posted the enhanced version on Instagram. I was pleased to notice that even the native Philadelphians I encountered were as mesmerized by the snowfall as this Texan was! Finally, it was time to head upstairs. My room was on the 26th floor so I took a few shots from that perspective before turning my undivided attention to rooting for Oklahoma in the Sugar Bowl. Indeed, life does throw some curve balls our way now and then. Although I would have preferred to be home with my family, I decided to make the most of this trip into winter. I thank God for the opportunity, and look forward to the next curve that comes my way! I settle into my aisle seat, 9D with extra leg space, and watch as my fellow passengers board our flight from Orlando to Dallas/Fort Worth. 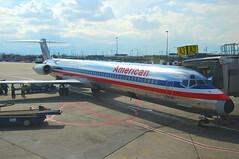 Flying home on a Tuesday evening usually means I’m sharing my flight mostly with other business travelers. However, that is usually not the case when flying out of Orlando. Passengers boarding our flight include families with young children sporting their Mickey Mouse headgear, young adults heading home after a long weekend getaway, and just a few of us road warriors sporting our casual business attire and our Swiss brand backpacks. All of us want the same thing: to take our seats and enjoy an uneventful flight to our final destination. Over the hustle and bustle of the boarding process, those words spoken in a husky voice by a female passenger close by grab my attention. She is seated in 8B, the aisle seat across the way and one row in front of me. Although we are at the gate, her seat is fully reclined as she sits under her blanket, clutching a plastic cup and a small stuffed pony. She is blond, middle-aged, and somewhat heavyset with large glasses. Her eyes are closed. Her husband, a rather small man with dark hair, is seated at the window next to her, looking outside and commenting on the baggage handlers and other tarmac workers busily prepping our plane for takeoff. She says it again as he comments on something else he sees as he points outside. Is she nervous? Is she downright afraid to fly? Maybe she’s not feeling well. Whatever it is, she appears to be quite uncomfortable and more than just a little annoyed. Seated behind the couple in 8A and 8B is an older couple obviously traveling together, both entranced with their iPads. Attired in dark dress slacks and a white business shirt with no tie, he is a distinguished looking gentleman with salt and pepper hair and silver wire frame glasses. She looks more than a tad bit younger than he, dressed in a sophisticated dark pantsuit with her iPad adorned in a white leather case. As the flight attendant walks by he points to “Honey, be still”, reclined so steeply that their eyes would meet if she simply looked up, silently reminding her that all seats are to be in their full and upright position for takeoff. The flight attendant acknowledges his gesture with a smile but says nothing. Now, fully tuned in to the people around me, I notice the gay couple seated in front of me. How do I know? Men don’t gaze into each other’s eyes and lean into each other unless there are feelings between them far beyond fraternal friendship. These guys aren’t buddies, they are a couple; even I can see that. Although I am not a fan of the gay lifestyle I can’t help but be touched by their obvious affection towards one another; I’m just hoping there is no in-flight PDA. Seated next to me are two ladies, each traveling alone. Both are donned in professional business attire and sport nicely coiffed blond hair. We exchange friendly greetings as I stand to allow each of them access to their respective seats, but once seated the three of us are all business. Beyond our friendly greetings we focus on our respective in-flight habits. 9F listens to her business motivational book on CD (I haven’t seen a portable CD player in a long time!) as she gazes out the window at the sunset on the horizon. 9E has her hardcover book called [Something] One nestled in her lap as she sleeps. I try to make out the title, but I can’t unless I lean far closer than what would be appropriate or comfortable. It has a large silver question mark on the cover; maybe you’ve read it. And I, in 9D, compose this essay as I observe the people around me. Well into our flight, “Honey, be still” wakes from her nap. From where I sit I see a smile on her face as she speaks softly to her husband. That’s a good sign. I take a sip of my red wine as I look at the people seated around me, and I can’t help but smile. Tonight we share a flight to Dallas. But I’m reminded that we all share this life we live on planet Earth. Each of us has a story. Each of us has a purpose. We have our burdens, our hopes, and our dreams. We have victories and we have losses. We have each other. I find myself lifting each of these people seated around me in prayer, asking God to guard and protect them as they complete this flight and continue on their journey through life. As I re-read the draft of this essay, feeling somewhat proud of my perception and intellect, “Honey, be still”’s husband rises from her seat and heads to the back of the plane. That’s right – her seat. He is a she, with short-cropped dark hair, sporting a gray tank top, baggy painter’s jeans and tattoos on both arms. What was once a smile is now a full-tooth grin as I remind myself that things aren’t always what they appear to be. Husband? Daughter? Partner? Caregiver? Close friend? I have no idea. All I know for sure is, as perceptive as I thought I was, I had totally missed the mark. “Honey, be still.” As I wash down my slice of Humble Pie with the remnant of my airline Cabernet, I’d say that’s some pretty good advice.